Miracle man of Gujarat Prahlad Jani(Mataji), a Hindu saint who has not consumed food or water for last 70 years in his 83 years life has been now kept under India’s Defense department research team’s continuous observation since 22nd of April. Jani is undergoing scientific medical tests on round the clock bases. He has been admitted to Ahmedabad’s Sterling hospital where laboratory is accredited as one of the best in India. A seven person team of DIPAS(a wing of India’s defense ministry) is trying to know how Jani can service without taking food or water, or even without throwing out urine and stool. If everything is ok with Jani, the study on his condition will continue for 10 or 15 days. The defense wing wants to understand what is the structure of Jani’s body, what is special about it, because of which he can survive normally. Whether the same can be replicated in others body, is the main question. If the answer is yes, it could be useful for soldiers and astronauts. Jani was earlier tested in year 2003 for 10 days in Sterling hospital under the observation of Dr. Sudhir Shah in Ahmedabad. 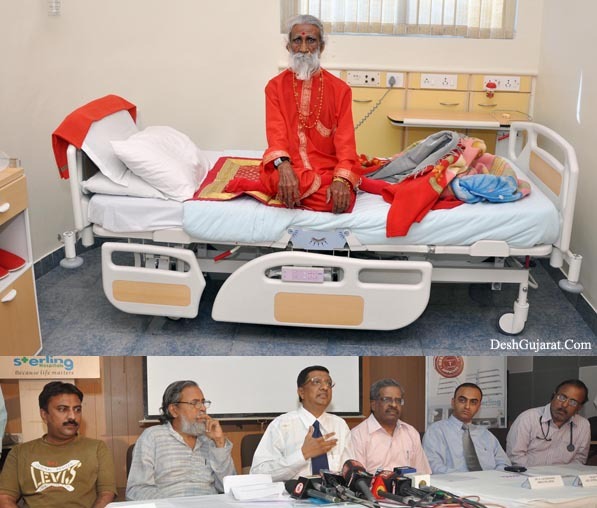 Mehul Jani – cousin of Mataji, Dr. Anil Gupta – professor at Indian Institute of Management, Dr. Sudhir Shah – senior doctor in Ahmedabad, Director of DIPAS, Sterling hospital CEO and Dr. Urmil Dhruv in photo above during press conference to brief the media about Mataji Prahlad Jani’s miracle. Doctors said not only consumption of food and water but also urination and stool outcome is absent in this man. When doctors instructed, Janu produced urine in bladder but he rotated that urine in his body itself and absorbed it rather than throwing it out. Normally if a person don’t go for urine in five or six days, he dies. But this man Prahlad Jani is miraculously an exceptional case. When doctors brought him from seventh floor to first floor for several laboratory tests and wanted to get him back to the seventh floor in lift, Jani refused and went upto seventh floor through steps. Doctors said he was so energetic that they had to run behind him on steps. About 35 doctors are supervising Jani and every possible test is being done on him on day to day bases.